A twig snapped in the darkness to the left of the rumbling, open-top truck. It was 5:30 in the morning and the sun had not yet come up over the horizon at Kruger National Park. As we plummeted forward on the dirt road, a giant white rhinoceros, only feet away and spooked by our sudden approach, thundered alongside the truck before veering off into the trees. 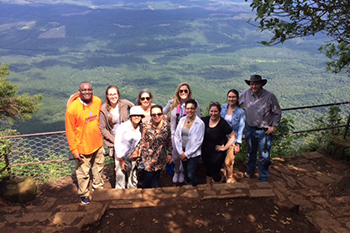 Students in the “Social and Economic Justice in South Africa” class pause during their trip to South Africa. It was only a split second, but it was an incredibly powerful moment. And I experienced several more of those moments throughout our 10-day South African experience. I, along with nine other College of Law students (and a couple of fabulous extras) spent over a week traveling the country learning the history, culture, legal and political structure, and experiencing the natural beauty of South Africa as a part of the one-credit “Social and Economic Justice in South Africa” class taught by Professor Deborah Kenn and facilitated by Felix James ’95 (College of Arts and Sciences). We started our adventure in Soweto, a township outside of Johannesburg, where we visited the Hector Pieterson Museum and the Nelson Mandela Family Museum just hours after landing at the Johannesburg Airport. The next day was just as jam-packed with sights and sounds as we departed for Kruger National Park in the wee hours of the morning. After spending the weekend in awe of the wildlife there and taking the scenic route back to Johannesburg, we visited the Constitutional Court—the country’s supreme court, still in its infancy—the Apartheid Museum and other incredible monuments of South Africa’s recent but successful struggle to break free from the brutally enforced apartheid government. The Constitutional Court was a wonder in itself, boasting an incredible array of anti-apartheid artwork and architecture. The history of South Africa’s struggle is literally built into the walls. That evening we had the honor of dining with the honorable Justice Yvonne Mokgoro, one of the original members of the Constitutional Court, hand-picked by newly elected President Mandela in 1994. And the powerful moments continued with seemingly endless opportunities to think critically about the nation’s efforts to combat the enduring effects of decades of racial oppression and act as witnesses to the unbelievable acts of reconciliation on both sides of the struggle. One of the highlights of the trip was a serendipitous run-in with Denis Goldberg, one of the original leaders of Nelson Mandela’s opposition group, the African National Congress, or ANC. We encountered Goldberg calmly drinking tea in the café at Lilliesleaf Farm, where over 50 years earlier he and several other ANC leaders were rounded up and arrested. They would each spend upwards of 20 years behind bars for their roles in fighting racial segregation, and it was an honor to sit next to, and shake the hand of, someone who risked everything for the rights of the Bantu people of South Africa. We went on to visit numerous other places of historical and cultural significance, including Parliament, Robben Island, Table Mountain, the Truth and Reconciliation Commission (now a part of the Department of Justice), and two of South Africa’s universities where we met with law students studying there. And we were certainly careful not to miss some of South Africa’s finest wineries! I could go on and on, but nothing I say could begin to capture the essence of the class, the quality of the College of Law professors and the wonders of South Africa. Suffice to say that it was an experience of a lifetime.